For other uses, see Lake Saint Clair (disambiguation). Lake St. Clair (French: Lac Sainte-Claire) is a freshwater lake that lies between the Canadian province of Ontario and the U.S. state of Michigan. It was named after Clare of Assisi, on whose feast day it was navigated and christened by French Catholic explorers in 1679. It is part of the Great Lakes system, and along with the St. Clair River and Detroit River, Lake St. Clair connects Lake Huron (to its north) with Lake Erie (to its south). It has a total surface area of about 430 square miles (1,100 km2) and an average depth of just 11 feet (3.4 m); to ensure an uninterrupted waterway, government agencies in both countries have maintained a deep shipping channel through the shallow lake for more than a century. This lake is situated about six miles (10 km) northeast of the downtown areas of Detroit, Michigan, and Windsor, Ontario. 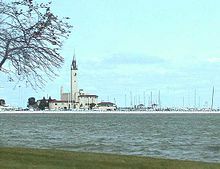 Along with the St. Clair River and Detroit River, Lake St. Clair connects Lake Huron (to its north) with Lake Erie (to its south). Lake St. Clair measures about 22.5 nautical miles (42 km; 26 mi) from north to south and about 21 nautical miles (39 km; 24 mi) from east to west. Its total surface area is about 430 square miles (1,100 km2). This is a rather shallow lake for its size, with an average depth of about 11 feet (3.4 m), and a maximum natural depth of 21.3 feet (6.5 m). However, it is 27 feet (8.2 m) deep in the navigation channel which is dredged for lake freighter passage by the U.S. Army Corps of Engineers. The lake is fed by the St. Clair River, which flows to the south from Lake Huron and has an extensive river delta where it enters Lake St. Clair. This is the largest delta of the Great Lakes System. Other rivers which feed Lake St. Clair are the Thames River and Sydenham River which originate in Southwestern Ontario, and the Clinton River which originates in Michigan. The outflow from Lake St. Clair travels from its southwestern end into the Detroit River, and then into Lake Erie. The tarry time (i.e. the time between entering and leaving) of the water in Lake St. Clair averages about seven days, but this can vary from as little as two to as many as thirty days, depending on the direction of the winds, the water circulation patterns, and the amount of water that is flowing out of Lake Huron. For water flowing through the navigation channel, the time period is only about two days. Lake St. Clair is part of the Great Lakes system, but is 17 times smaller in area than Lake Ontario. It is rarely included in the list of "Great Lakes" but is sometimes referred to as "the sixth Great Lake." There have been isolated proposals for its official recognition as a Great Lake, which might enable it to attract public funding designated to the Great Lakes for scientific research and other projects. First Nations/Native Americans used the lake as part of their extensive navigation of the Great Lakes. The Mississaugas called present-day Lake St. Clair Waawiyaataan(ong), meaning "(at) the whirlpool", and the Wea tribe's name derived from the lake's Miami cognate Waayaahtanonki. The Mississaugas established a village near the lake in the latter part of the 17th century. Early French mapmakers had identified the lake by a variety of French and Iroquois names, including Lac des Eaux de Mer [Seawater Lake]; Lac Ganatchio ("kettle," for its shape), in French Lac de la Chaudière. A variety of Native names were associated with sweetness, as the lake was freshwater as opposed to saltwater. These included Otsiketa (sugar or candy), Kandequio or Kandekio (possibly candy), Oiatinatchiketo (probably a form of Otsiketa), and Oiatinonchikebo. Similarly, the Iroquois called present-day Lake Huron, "The Grand Lake of the Sweet Sea" (fresh water as opposed to salt water.) This association was conveyed on French maps as Mer Douce (sweet sea) and Dutch maps as the Latin Mare Dulce. On August 12, 1679, the French explorer René Robert Cavelier, Sieur de La Salle arrived with an expedition. He named the body of water Lac Sainte-Claire as the expedition discovered it on the feast day of Saint Clare of Assisi. The historian on the voyage, Louis Hennepin, recorded that the Iroquois called the lake Otseketa. As early as 1710, the English identified the lake on their maps as Saint Clare. By the Mitchell Map in 1755, the spelling appeared as St. Clair, the form that became most widely used. Some scholars credit the name as honoring the American Revolutionary War General Arthur St. Clair, later Governor of the Northwest Territory, but the name Lake St. Clair was in use with the current spelling long before St. Clair became a notable figure. Together the place name and general's name likely influenced settlers' naming a proliferation of nearby political jurisdictions: the Michigan county and township of St. Clair, as well as the cities of St. Clair and St. Clair Shores. The origin of the name has also been confused with one Patrick Sinclair, a British officer who purchased land on the St. Clair River at the outlet of the Pine River. There, in 1764, he built Fort Sinclair, which was in use for nearly twenty years before being abandoned. Unlike most smaller lakes in the region—but like the Great Lakes—Lake comes at the front of its proper name, rather than the end; this is reflective of its French origins. Lake St Clair's location, downstream from the largest freshwater delta in the Great Lakes, has a large effect on its turbidity (clarity). Current water quality is quite good despite past incidents and a history of chemical bio-accumulation. A number of cities source drinking water from or just downstream of the lake and quality is closely monitored. In the early 1970s, the Canadian and American governments closed the commercial fishery over concerns of bio-accumulation of mercury. The industry responsible for this contamination was the Dow Chemical Chlor-Alkali Plant in Sarnia, Ontario. Since 1949, Dow Chemical had been operating mercury cell plants for the production of chlorine and other chemicals. Through its production process, it discharged mercury into the river and contaminated the fishery. The fishery has since not been re-opened, although studies have now confirmed mercury levels are well within the safe range. Sport fishing remains popular in the lake. The governments on both sides of the lakes continue to monitor and publish guides for sport fish consumption. Beach on Lake St. Clair near St. Clair Shores. Mitchell's Bay Beach, Mitchell's Bay, Ontario, is a small community located on the east shore of beautiful Lake St. Clair. The shallow warm water is great for windsurfing, kite surfing and swimming with kids. New Baltimore, beach at Walter and Mary Burke Park in Downtown New Baltimore, Michigan. Belle Isle Beach, a half-mile-long swimming beach located on the west side of Belle Isle, Michigan. Sandpoint Beach, located in Windsor, Ontario near Riverside Dr. East and Florence Ave.
Marine City Beach, north end of Water Street in Marine City, Michigan. Lake St Clair Metropark, Harrison Township, Michigan. Belle Isle Beach, Belle Isle, Michigan; located on the west side of the island, this beach provides a safe swimming area away from the currents of the Detroit River. The beach is well manicured with clear water and sandy bottom. Nice shade trees and grass border the beach. ^ a b c d e f g h i "Lake St. Clair summary report" (PDF). Great Lakes.net. Retrieved December 2, 2007. ^ a b "Chapter 1:Introduction to Lake St. Clair and the St. Clair River". United States Army Corps of Engineers. June 2004. Archived from the original on January 10, 2009. Retrieved June 8, 2008. ^ "Shorelines of the Great Lakes". Michigan Department of Environmental Quality. Archived from the original on April 5, 2015. ^ Jones, Terril Yue (October 20, 2002). "Movement Would Thrust Greatness on Lake St. Clair". Los Angeles Times. ^ Jenks, William Lee (2005) . "Origin of Name". St. Clair County, Michigan, its history and its people. Ann Arbor: University of Michigan Library. p. 24. Retrieved November 23, 2007. ^ Jenks (2005), p. 22. ^ Jenks (2005), pp. 23–24. ^ Fuller, George Newman (2005) [1926?]. "Indians and Explorations". Local History and Personal Sketches of St. Clair and Shiawassee Counties. Ann Arbor: University of Michigan Library. pp. cc=micounty, rgn=full%20text, idno=ARH7752.0001.001, didno=ARH7752.0001.001, view=image, seq=00000017 21–22. Retrieved November 23, 2007. ^ "Water Quality in Windsor". City of Windsor. Retrieved August 23, 2017. ^ "Thames–Sydenham Source Protection Region". Thames-Sydenham and Region Source Water Protection. Retrieved February 15, 2015. ^ "Mercury in Lake St. Clair Walleye". United States Environmental Protection Agency. Archived from the original on September 24, 2015. Retrieved February 15, 2015. ^ "Eating Ontario Fish". Ministry of the Environment and Climate Change. Retrieved August 23, 2017. ^ "Eating Fish from Michigan's Lakes & Rivers". Michigan Department of Health and Human Services. Retrieved August 23, 2017. ^ "Crescent Sail Yacht Club". Retrieved February 15, 2015. ^ "Clinton River Boat Club". Retrieved August 12, 2015. ^ "Albatross Yacht Club". Retrieved February 15, 2015. ^ "North Star Sail Club". Retrieved February 4, 2015. ^ "Lakeshore Sail Club". Retrieved February 15, 2015. ^ "South Port Sailing Club". Archived from the original on February 4, 2015. Retrieved February 4, 2015. ^ "St. Clair Sail Club". Retrieved February 15, 2015. ^ "Thames River Yacht Club". Retrieved February 4, 2015. Wikimedia Commons has media related to Lake St. Clair (Michigan-Ontario). This page was last edited on 30 January 2019, at 16:39 (UTC).